The field of chemistry interfaces with and often supports a wide range of disciplines, such as molecular and environmental biology, genetics, medicine, mathematics and physics... to name a few. which appeal to a variety of interests. The Chemistry and Biochemistry Department provides students with an excellent foundation in chemistry, encompassing both theoretical concepts and practical applications, and prepares them for the next step in their chosen career paths. A chemistry background serves as a foundation for many careers in seemingly "nontechnical" areas, areas in which a technical background would give you a great advantage. For example, sales and management positions in the pharmaceutical industry or administrative positions in government laboratories would be attractive to individuals with both chemical and business training. The Department of Chemistry and Biochemistry is pleased to announce that Dr. Michael Beck and Dr. Steven Pellizzeri will be joining us as new Assistant Professors starting in Fall 2019. Chemistry and Biochemistry is a small, close-knit department where students get significant one-on-one mentoring by full-time faculty. We celebrate the success of our students in being accepted into high-quality graduate school (PhD programs) and medical and professional schools or getting started immediately on careers in industry or high school teaching. 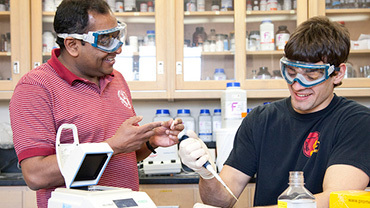 All 15 faculty members in the Chemistry and Biochemistry Department have active research programs that welcome undergraduate student collaborators as early as freshman and sophomore years. Research projects include analysis of the gases evolved in the use of biomass for fuel, precise measurements of the actual forces involved when two single molecules collide, advanced photovoltaics (solar energy conversion), the biochemistry of disease development, organic synthesis of molecules with particular properties (light-sensitivity) or with targeted structures, control of reactions between single molecules in solid crystals, the construction of chemical sensors, and projects related to chemical education. The department also has an active summer research program right here on campus but also encourages students to pursue internships in the chemical and pharmaceutical industries. Our students enjoy the use of modern instrumentation and a dedicated chemistry student computer lab for both laboratory and research classes. The department also houses a regional X-ray diffraction facility which students can be trained to use. (X-ray diffraction can be used to actually build a 3D image of single molecules in crystals.) In addition, the department has an Atomic Force Microscope (AFM) which can map the molecular contours of solid surfaces. BS in Science with Teacher Certification (Chemistry and Biochemistry specialization) - to prepare future high school chemistry teachers. Accelerated BS/MS Degree - get both a BS and MS degree in 5 years! MS Chemistry Degree - a two-year research and thesis-based graduate degree. Our BS Chemistry and Biochemistry(Chemistry and Biochemistry Concentration) and BS Chemistry and Biochemistry(Biochemistry Concentration) degrees are American Chemical Society (ACS) approved curricula. We also have a nationally recognized chapter of the Student Affiliates of the American Chemical Society, a professional, service-oriented, and fun organization! Students in this program take courses in biology in addition to advanced work in biochemistry. This course of study is attractive to students interested in understanding the chemistry of living systems leading to employment in the biotechnology industry or further study in medicine, dentistry, or graduate school. Click here for more information on this program. Students interested in teaching high school chemistry earn a Bachelor of Science with Teacher Certification, Chemistry and Biochemistry Specialization. The aim of this program is to train and certify students to be excellent high school science teachers with a specialty in chemistry. Click here for more information on this program. This is an American Chemical Society (ACS)-approved program, chosen by many students interested in employment in industry or government, as well as by those students pursuing advanced degrees (M.S. or Ph.D.) in chemistry. Click here for more information on this program. This concentration prepares students for positions in sales or management within the pharmaceutical or chemical industry where often both chemical and business skills are required. This program includes foundation courses that are required for many MBA programs. Click here for more information on this program. Students interested in going on to medical, dental, or pharmacy school after obtaining their B.S. in Chemistry and Biochemistry should consider either the Chemistry and Biochemistry or Biochemistry Concentrations and take appropriate courses from the Biological Sciences department. Click here for more information on this program. Dr. He has strong research interests in photoactive materials with broad applications in organic photovoltaics, optoelectronics, and other thin-film devices. He has extensive experiences in inorganic and organic synthesis, high performance computing, small molecule crystallography, photovoltaic device fabrication/characterization, and nanofabrications. His research is highly interdisciplinary. Dr. Periyannan's research focuses on all aspects of hydrolytic enzymes, especially Zn-metalloproteases and glycoside hydrolases in order to understand their physiological function, in disease development and molecular evolution of bacterial life in oligotrophic environments. "I felt as though I received one-on-one attention from the majority of my professors, who sought to ensure the best possible education for all of their students. Despite coming from a smaller school than many of my peers here in Chicago, I feel as though I received a very solid foundation for many concepts and subjects that were further expanded upon in medical school." "I think the EIU chemistry department did a great job of helping me learn a good foundation in science and even more importantly I gained critical experience in evaluating often very difficult problems. Both the junior and senior seminars that we were required to give allowed me to really understand critically evaluating basic and clinical science research. "